When I first visited Ted Watkins Park at 103rd and Central shortly after my arrival in L.A. in 2001, I didn’t stay very long. In the mid-1990s, the park had been renamed to honor activist and organizer Ted Watkins following his death in 1993. But instead of mirroring Watkins’ spirit by uplifting the community, the poor conditions in the park served as yet one more reminder of just how many promises to invest in the community after the 1992 uprising had not been kept. Fast forward a decade and a $6.8 million renovation later, and Ted Watkins Park is finally the park the community deserves. Bright and colorful, nicely landscaped, chock-full of picnic tables, playing fields and handball courts, and peppered with fitness equipment along the west side, it is a jewel of the community. During daylight hours, you can find many people working out on the equipment and jogging or walking around the outer edge of the park (there is even a path through the tree-lined fitness area on the west side, so folks don’t have to make their way past the guys selling used cars along the park’s edge on Central). The handball courts, skate area, and children’s play area are also always bustling with activity. With regard to programming, the Watts farmers’ market can be found there Saturday mornings (10 a.m. – 2 p.m.), there are often formal soccer games or informal practices and games happening at one or more of the playing fields, and, in summer, the Parks After Dark program lets people enjoy the park until late into the evening. While both the renovations and programming play an important role in the park’s success, my observation is that programming plays a bigger role than you might imagine. 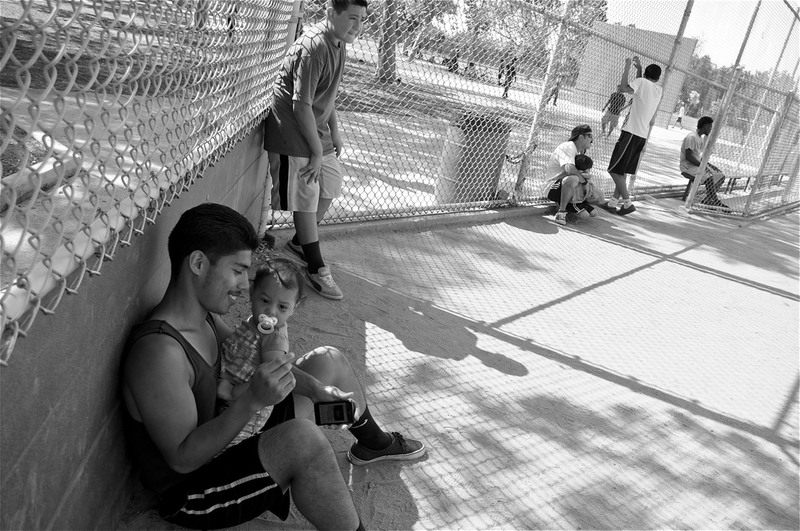 There are very few recreational opportunities for older youth in Watts (or adults, for that matter). Even Parks After Dark, much like Summer Night Lights at city parks, tends to cater its programming to younger kids. And, while violence is in the area is down and places like Ted Watkins are much safer, youth do not always feel they have the freedom to hang out in public spaces with friends. Rivals from their past and perpetual knuckleheads of all sorts are still around and often looking for an excuse to start a fight. So, unless they have a specific reason to be at there or have older adults on hand who can act as buffers, youth are often wary of heading to the park on their own. Which is why things like the summer kickball league, first launched by Javier “JP” Partida (president, Los Ryderz Bike Club) and John Jones III (president, East Side Riders) last year, are so important. 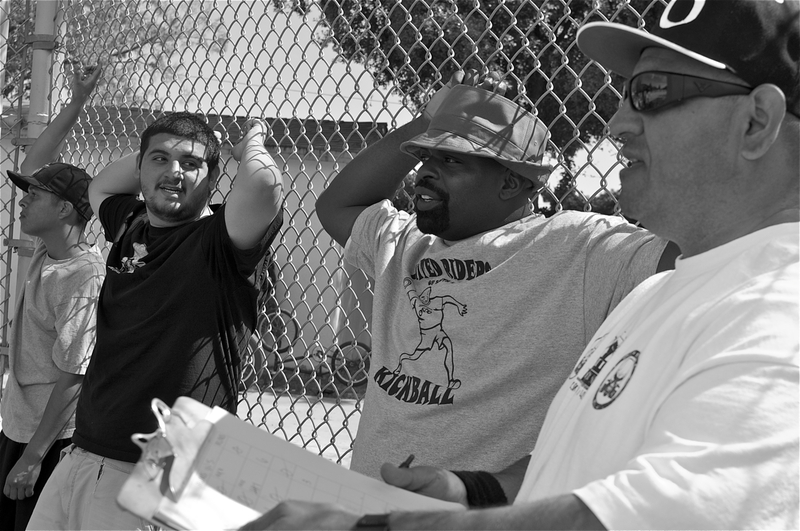 John Jones III (center) and JP Partida (right) oversee the game in progress. 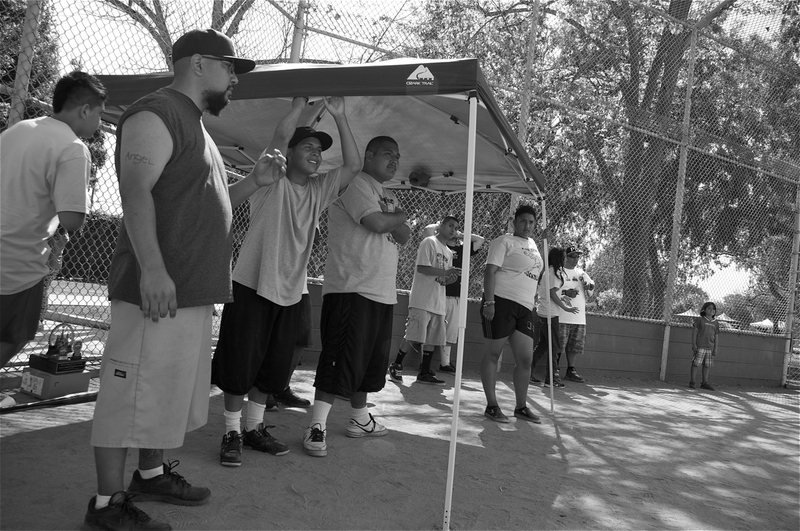 Despite having a full calendar of bike events with each of their clubs and together, as the United Riders of South L.A., both Partida and Jones felt it was important to keep the youth occupied and healthy on summer nights when the temptation to get into trouble is strong and violence tends to spike. They cobbled together a roster of teams, pulling students from Inspire Research Academy (the continuation school based at YO! Watts), youth and adults from the bike clubs, and a mix of folks from other community groups. In doing so, they set an important example for other park-goers of how black and brown communities can collaborate in an area where tension between the two groups can sometimes run high. 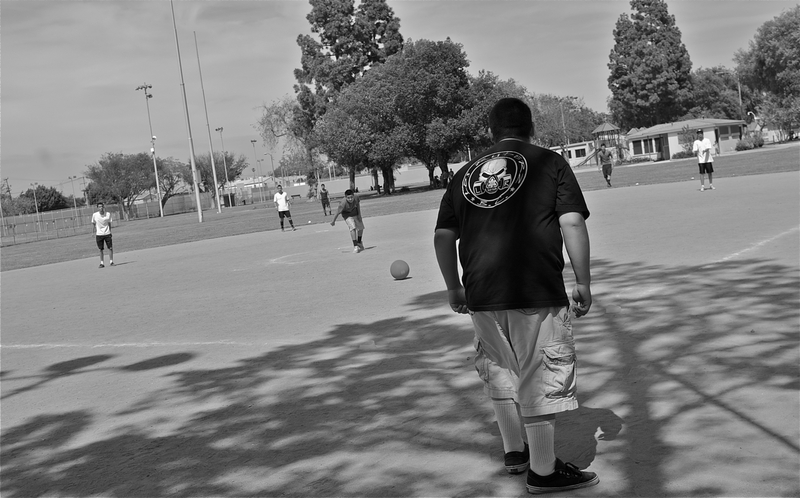 This past weekend, they hosted the South L.A. Kickball Classic Spring Tournament, bringing together a number of teams from the area and even some from outside, including the Ovarian Psycos (from Boyle Heights). They kicked things off at 10 a.m. and braved the heat through most of the afternoon. They even attracted a steady stream of curious onlookers who wanted to know what all the fun was about. 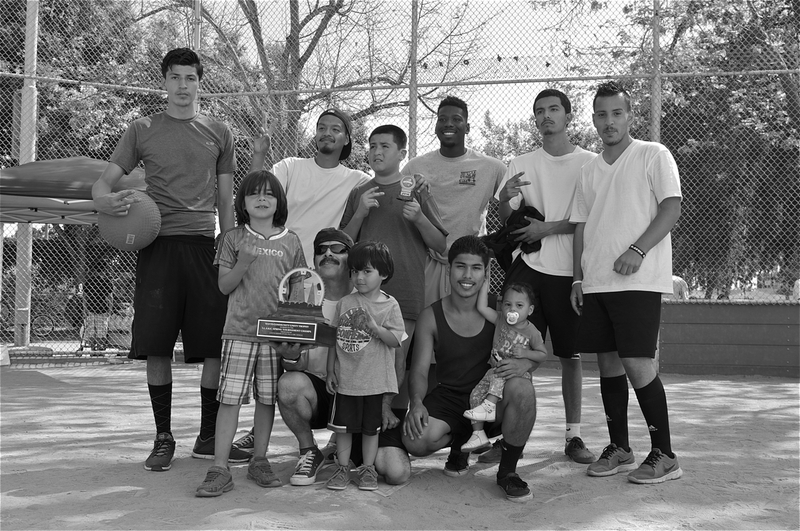 The winners — for the second year in a row — were a mix of gangly youth from the wood shop at the Watts Labor Community Action Committee (WLCAC). As the day wound down, there weren’t too many folks left to enjoy the barbecue Los Ryderz had set up or have a piece of the cake in celebration of their second anniversary. Players with young kids and those who had lost had taken off, worn down by the hot sun. Still, the day had been a tremendous success. 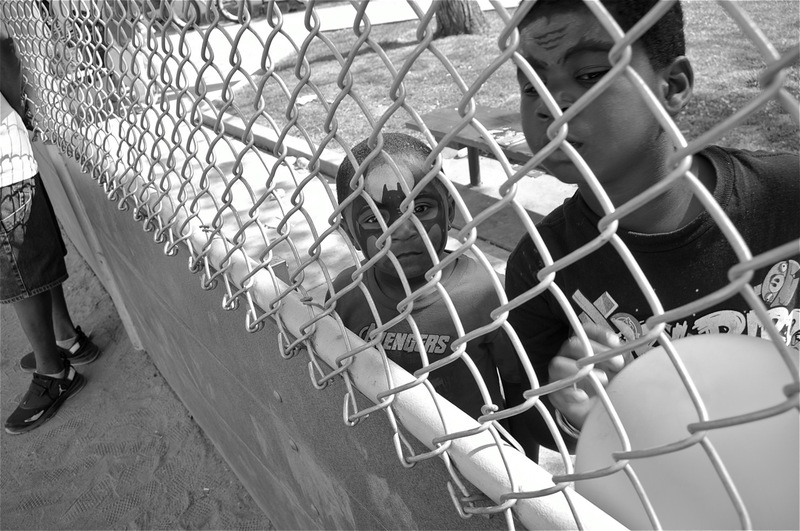 The park had been bustling, youth you don’t normally see playing outside had had a full day, new connections had been made, and some of the people watching described being inspired at seeing folks from their own community take the initiative to make Watts a better place. As I hugged new and old friends good-bye, I caught myself laughing out loud at the memory of how unwelcoming this park had been all those years ago. Partida and Jones seem to have understood the power of what they have done, as well. As he was putting away supplies back at YO! Watts (one block over from Ted Watkins Park), Partida was already talking about how the summer league was shaping up and the possibility of expanding the roster to help build more bridges throughout the community. This is how it happens, I thought. This is how people take back their public space. I just wish they didn’t make it look so easy. 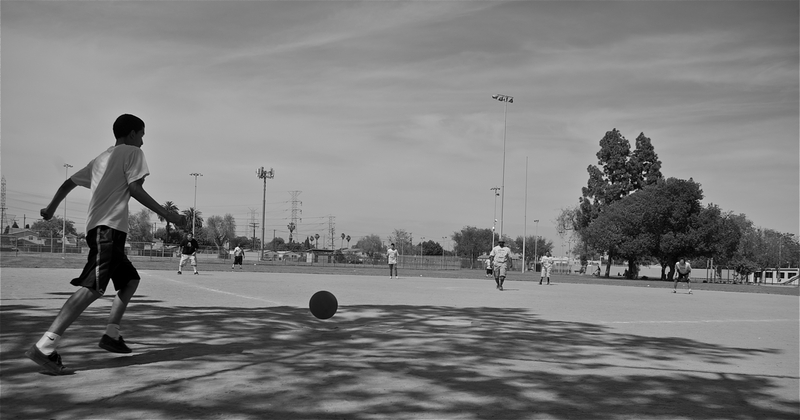 Bike rides and kickball games may be the simplest of activities out there, but making them happen in Watts isn’t. Every weekend (and some weeknights) are dedicated to their clubs’ activities. Weekdays, Partida can often be found up early, working on his club’s bikes at 5 a.m., several hours before he goes to work. Every time I visit him, he talks about an event he’s planning, a roster he’s putting together, or a t-shirt he’s designing for his riders to wear. The East Side Riders spend their summer nights fixing kids’ bikes for free at Parks After Dark and at just about every other community event that happens in South L.A. 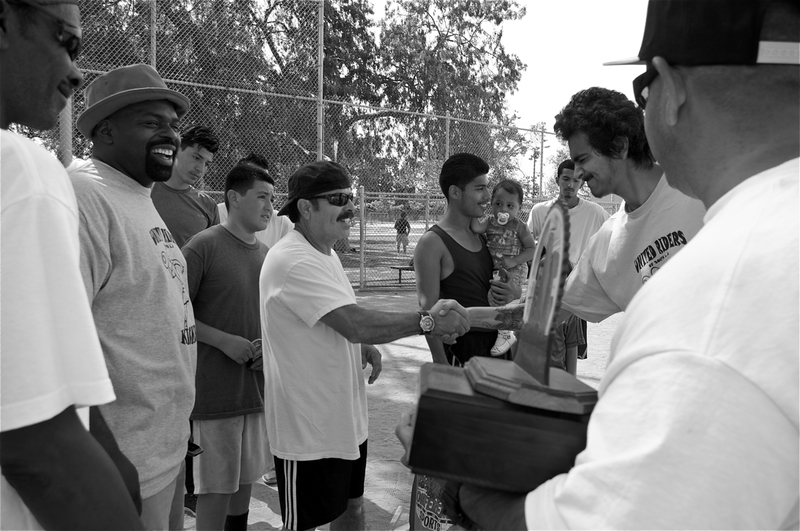 Both actively mentor the youth to help them leave their gang lives and mentalities behind. And, all expenses for both clubs come out of their own pockets. It’s a lot to ask of someone to give to their community. But Partida, Jones, and many of their clubs’ core members feel they have no choice, given that the parks often lack the funds for that level of intensive recreational programming. Even the Plan for a Healthy L.A., which recognizes the need for more programming in parks, focuses its recommendations on after-school activities for elementary and middle school youth, and talks only vaguely of expanding recreational programming for all ages in existing parks in underserved areas. Nor does it take GRYD to task for not doing enough to address older youths’ needs more concretely or for failing to partner with local community groups that could help programs like Summer Night Lights generate deeper and more sustainable positive impacts. Luckily for Watts’ youth, Partida and Jones have made community betterment a personal mission and plan to keep at it for as long as they can. The United Riders are in the process of putting together their summer kickball league. If you’d like more information or think you might like to put together a team, please contact Los Ryderz or the East Side Riders. I wonder if Yoga counts? Someone ask Eric Garcetti. Empowering Communities to See Streets as Sites of Recreation: What does it Take? Riding to CicLAvia from South L.A.? We’ve Got Four Feeder Rides for You!